A few weeks ago, I published my first piece on white privilege in online dating. The racial, body and gender stereotypes I have encountered as a non-white person in the dating world established some of my motivations for founding Siren -- a dating app that highlights personality and conversation, elements that should trump a photo for a true sense of one-to-one chemistry. My original post kickstarted a dialogue that continues to resonate. I was especially excited to hear from other people of color who wanted to add their personal thoughts and experiences to mine, and have decided to feature some interviews as part of an ongoing series. We begin with the incisive and observant Wagatwe Wanjuki, feminist writer and activist based in the N.Y.C. area. 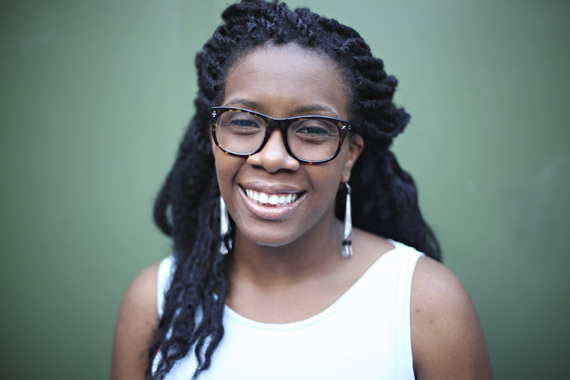 She is best known for her activism and commentary around campus sexual violence and new media. When she isn't traveling the country doing speaking gigs at colleges across the country, Wagatwe's got a soft side and values extra snuffle time with her bunnies. Does race factor in online dating in your experience? On a personal level: Yes, definitely. I notice that now the role of race in regards to online dating has more to do with me protecting myself in reaction to other users rather than it factoring into whether I am interested in someone or not. I also notice that just would get a MUCH lower level of interest from other users. Or I'd get gross fetishizers looking for dose to satisfy their jungle fever. Do the photo-forward sites amplify or mitigate this? Is it different than other social media or similar? I definitely think that photo-forward site amplify racial preference in online dating. Even if it isn't intentional, people have some pretty racist dating preferences for some ridiculous reasons. When services put it upfront and center, they are able to use their implicit bias without even have to think twice about why it exists. It's easier to just chalk it up to personal attraction or what "beauty" is. I think it's different than other online media because, while harassment is expected on almost any sort of social media, the good part is that you can protect yourself through privacy settings -- you can limit who can be your friend/follower. With online dating you're literally on there to be judged by others. And the judgment starts from the photo and there's no rolling regular updates that can show who or how you are in the day-to-day. How do you think media portrayals of POC affect people's expectations when meeting POC for the first time? Two things come to mind -- people avoid meeting POC altogether, lol. Or they come into the interaction expecting a very one-dimensional person. Their views of POC fail to acknowledge how diverse the behaviors and cultures run amongst us. It ends up creating a lot of wasted time for POC when they realize they have to interact (even if only briefly) with a likely incomplete, objectifying view of them. What's your take on "white privilege" in dating? I think white privilege manifests in a very simple way in online dating. There is a hierarchy of the most desirable -- with white people on top of that hierarchy. The closer you are to it, the better off you are. It's so prominent that in heterosexual dating; white men are preferred over men from the same race of other women. That just speaks volumes to me. I'm not sure how we can move beyond racism in online dating because it's just a manifestation of our society as a whole. I definitely think that taking emphasis away from looks is helpful in online dating. For example, when I was prompted to look at the top women on The Grade, they all were white thin women with the "highest grades," which meant special perks over the 'lesser" members. It just reinforces the idea that the most beautiful people who fit White Western beauty standards will be recognized as being wanted the most and thus rewarded. I would love to see the online dating world find a way to work with the biases and microaggressions that people of color face. Attraction matters, but there must be a way to make the search less soul sucking. Race matters in society so it'll matter in dating. I just hope we can find a way that makes it a lot less painful -- and racist.